The hardest thing when someone changing diet is to find new food that can step into the place of the old ones. Be it Atkins, Paleo, Keto, Fasting or Sugar free, most of the diets require rethinking not only what we eat but how we live our life as well. Well, fasting must be the easiest of all cos we don’t have to think constantly about what we should cook that has no carbs but still tasty. We don’t eat, we are going to be hungry, we have to get used to it. It seems that changing way of life is much easier than changing what we like to eat. To be honest, we can’t really do anything about it. It’s not really our fault. Our primitive reptile brain is responsible for all the unconscious actions like breathing, heart beats, eating and suchso it is to blame for that. This part of our brain that keeps us alive day after day and protects us from unforeseen dangerous situations decides what we like to eat for breakfast, lunch and dinner too. As the primary function of this brain is to keep us alive as long as possible with the smallest possible effort, it will always choose food that provides the most calories with as little invested time and energy as possible. No wonder, fast food is thriving. We are hardwired to eat such a food by life itself. Although, it doesn’t explain why Japanese fast food is healthy and the rest of the world eats crap but this is a different topic. However, this primitive brain has great influence on us and what we do, luckily it has no will of its own and trainable for new things. Like training it to choose salad instead of hamburgers when we are hungry. So, the first step into this utopian world where our brain only picks food that aren’t trying to poison us is, to provide our subconscious the means to choose from. That means to reach back in time and look for recipes before the food industrialization process has taken its foothold in our life and eliminated everything that can’t be made quickly and eaten out of a box. There is hope in the future though. 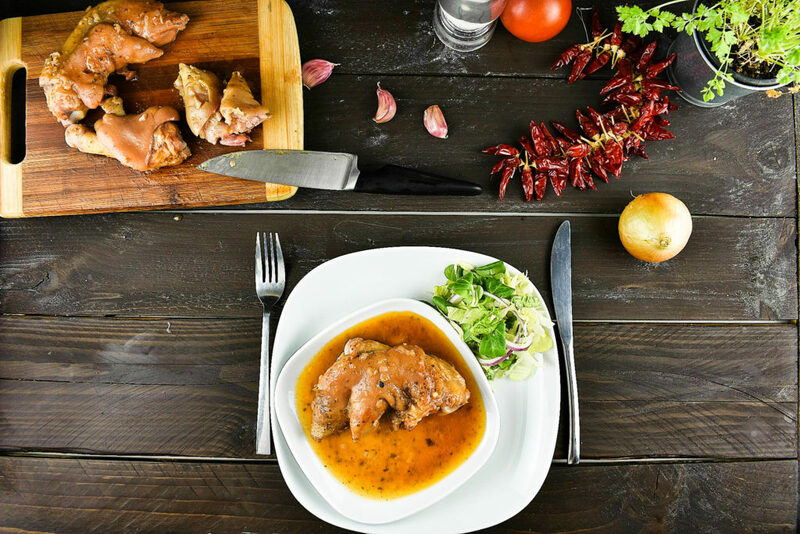 There are still traditional recipes out there to fill our dire needs when we long them most. This sometimes means to look into other countries’ cuisines where industrialization started much later and ruined less customs. Other times it just means to use ingredients that aren’t in the mainstream prepackaged fridge in the shops and requires an extra trip to the butcher. Like who would think of making something out of the feet of a pig. It doesn’t need an excessive preparation though. It may be advisable to ask the butcher to open them up or cut them into halves but other than that it isn’t really necessary. Sure enough, we can sauté a bit of onion or mirepoix before we start to cook but it will be just fine without them. 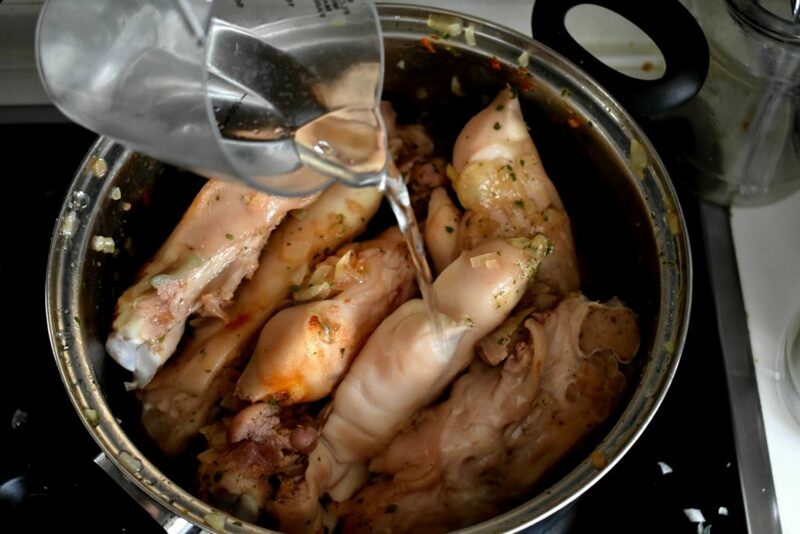 The only thing the pork feet requires, to add the ingredients into the same pot and cook it until it’s so nice and tender that everything just falls off the bones. Delicious! 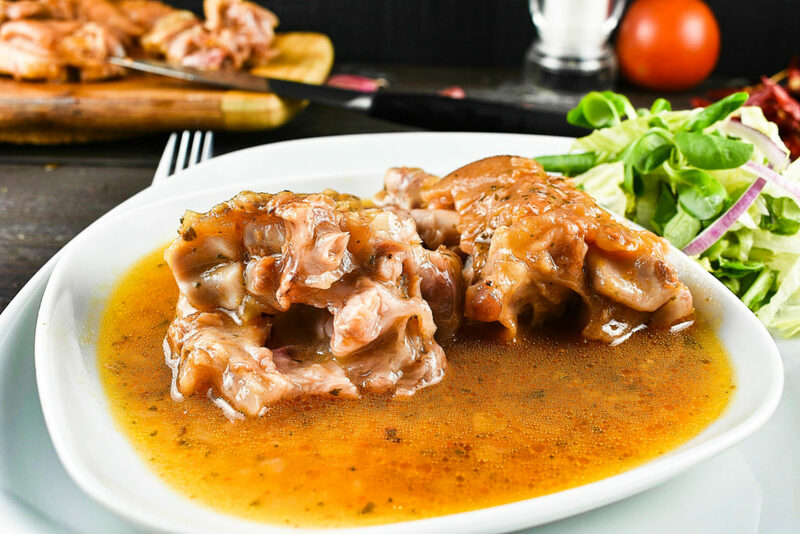 Pig feet or pig trotters in the U.K. as we may expect aren’t full of lean meat but bones, skin and fat. 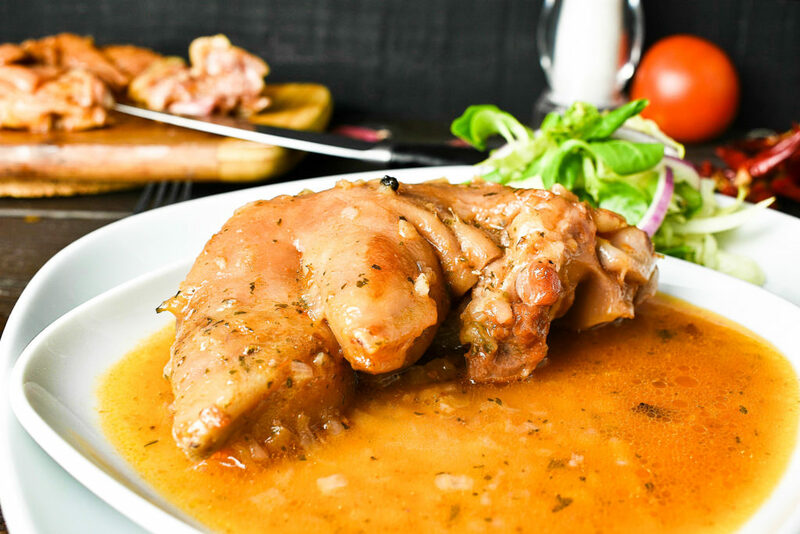 In fact, a pig’s feet contain the same amount of protein as fat. If it is prepared right, it is a juicy and tender cut of meat that has no equivalent, except maybe the beef tripe. Add the diced onion and saute it until it gets a translucent, glassy look for about 3 to 5 minutes. Add the pig’s feet and mix it well then cook it for 5 to 10 minutes until the skin gets some golden brown color. Add the paprika, parsley or celery, garlic and tomato. Add water to submerge all the feet to around 3/4. 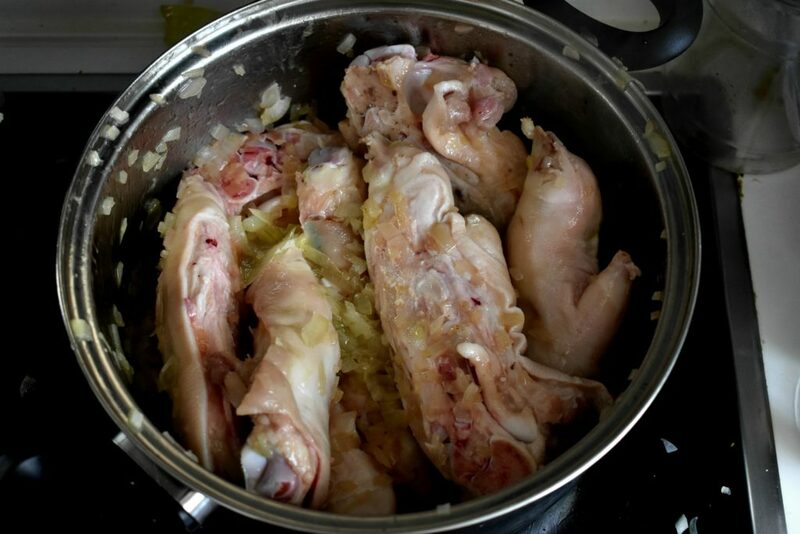 Place the lid on and simmer it on low heat for about 3 to 4 hours or until the meat peals off the bones easily. Mind to have enough water during the cooking period or else it may burn down. Remove the lid half an hour before finishing the cooking to reduce the excess water until the feet are only half or even less submerged. Pig's feet isn't the leanest cut nor the one with less bones but it certainly the tastiest of pork. Juicy, tender and irresistible. Add the pig's feet and mix it well then cook it for 5 to 10 minutes until the skin gets some golden brown color. 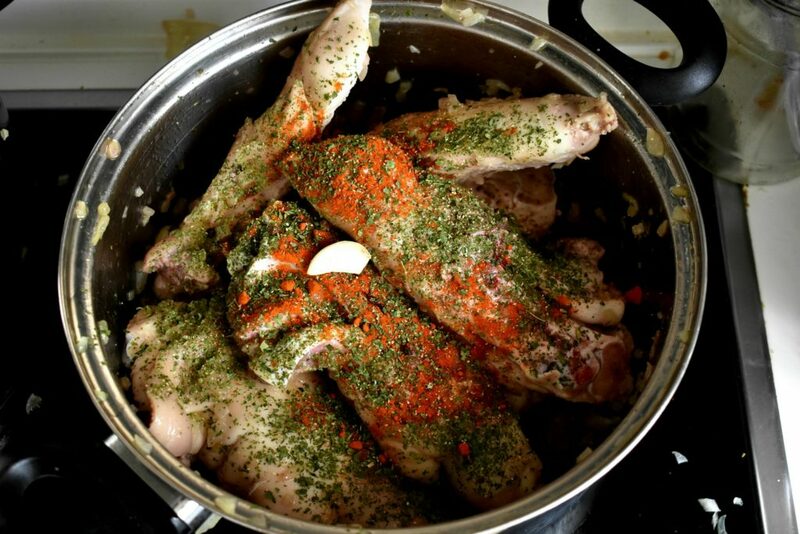 Place the lid on and simmer it on low heat for about 40 minutes or until the meat peals off the bones easily. Mind to have enough water during the cooking period or else it may burn down.